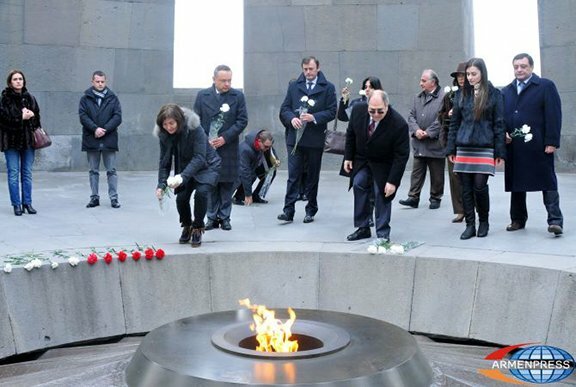 YEREVAN (Combined Sources) — French Secretary of State for Development Annick Girardin visited Tsitsernakaberd Memorial Complex on January 23 to commemorate the victims of the Armenian Genocide. Girardin laid flowers at the Eternal Flame of the memorial, paying tribute to the innocent victims of the Armenian Genocide. Afterwards, the Secretary of State toured the Armenian Genocide Institute-Museum and familiarized herself with the exhibited items and the history of “Mets Yegern” (Genocide). In an interview, Girardin mentioned that she is anxious and shocked by the items exhibited in the Institute-Museum and the history of Genocide. “I have brought a message from France: France stands side by side with friendly Armenia. Our country has supported and backed Armenia and will continue doing that,” the Secretary of State said. Speaking about the current phase of the bill criminalizing the Armenian Genocide denial, Girardin reminded those present that France recognized the Armenian Genocide, two visits at the presidential level have taken place, and France participated in the commemorative events in Yerevan on the 100th anniversary of the Armenian Genocide. In her words, debates are now underway in both the Senate and the National Assembly (the lower house). Girardin added that the Armenian Genocide issue was also discussed in the International Organization of La Francophonie whose president condemned the Genocide. In her words, today we also witness similar crimes in different parts of the world and it is the duty of all of us to prevent mankind from such calamities. “Naturally our organization acknowledges the fact, but it should be admitted that it is a page in the history that needs to be turned. We are here to take an active part in various spheres of Armenia such as economy, tourism, and education so that Armenian youths will be able to use their knowledge effectively for their country’s development,” Girardin said.